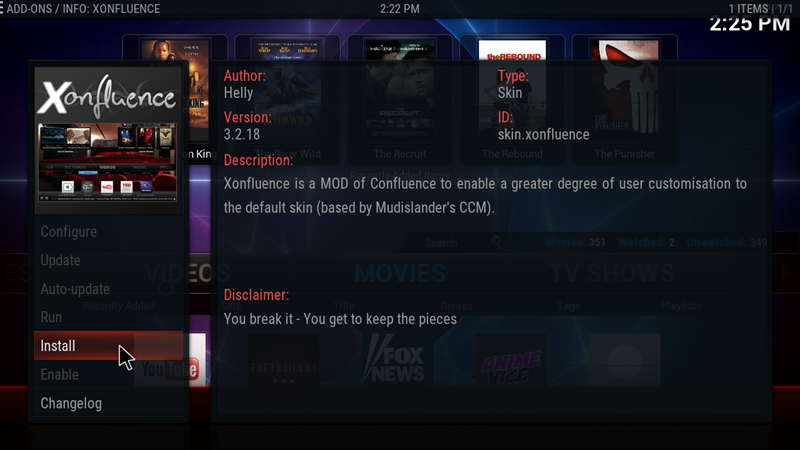 Χonfluence is a simple and easy to custom Skin. The configuration menu gives you access to almost everything you need to personalize your Kodi, create menu, submenus, change the look and feel of your system. 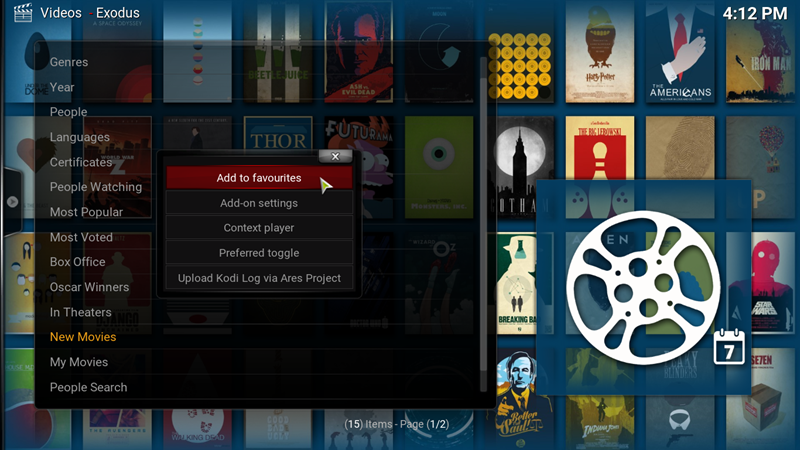 add some widgets to easy access your content and make the first step to your own Kodi Build. The options are too many, but today we will cover only the basics. 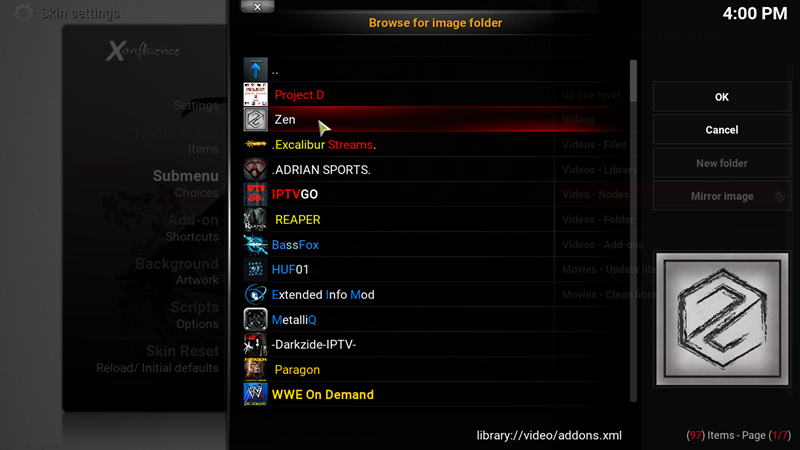 I’m going to show you how to install it, how to Configure your own Menu items, add Submenu, Addon Shortcuts and widgets. 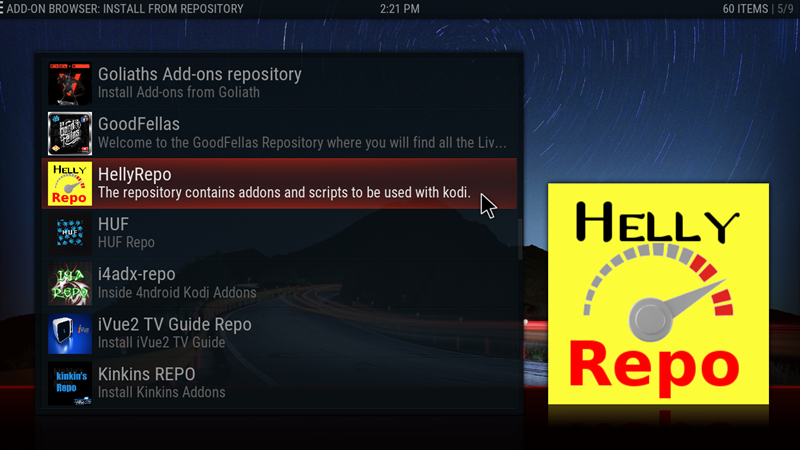 You can make your Kodi look exactly as you want. Let’s begin. Follow the Installation Guide or watch our Video guide. • First we need to install the Helly Repository. You will find it HERE. • We can see all the Repositories installed in our system. 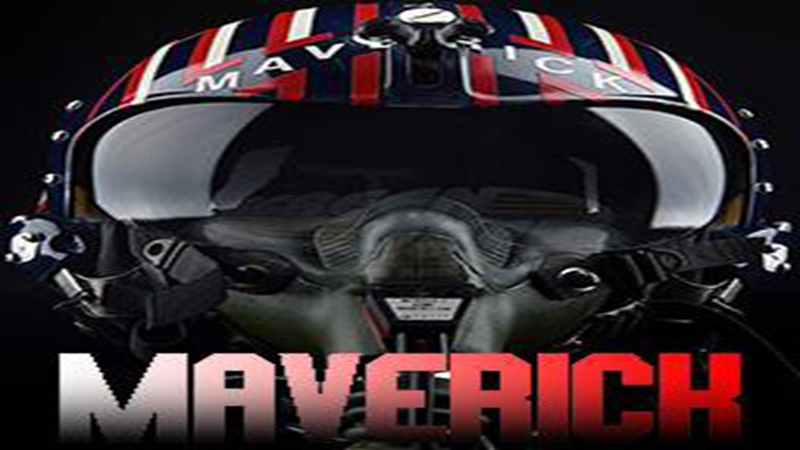 Select HellyRepo. 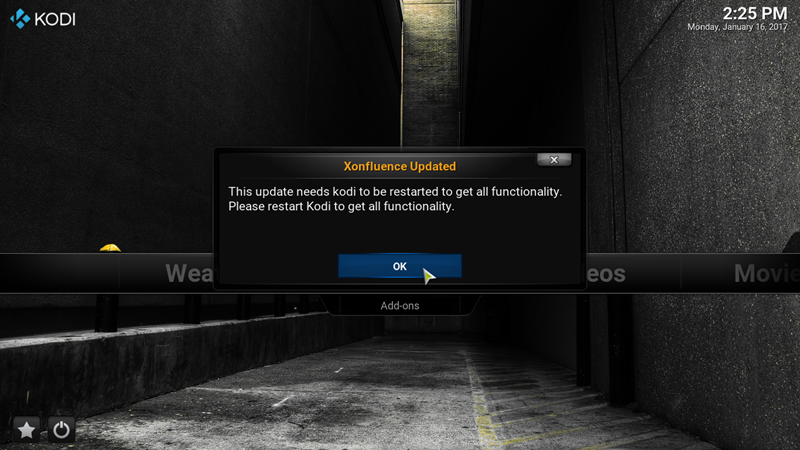 • Then, you have to restart your Kodi. Click OK and manually restart it . 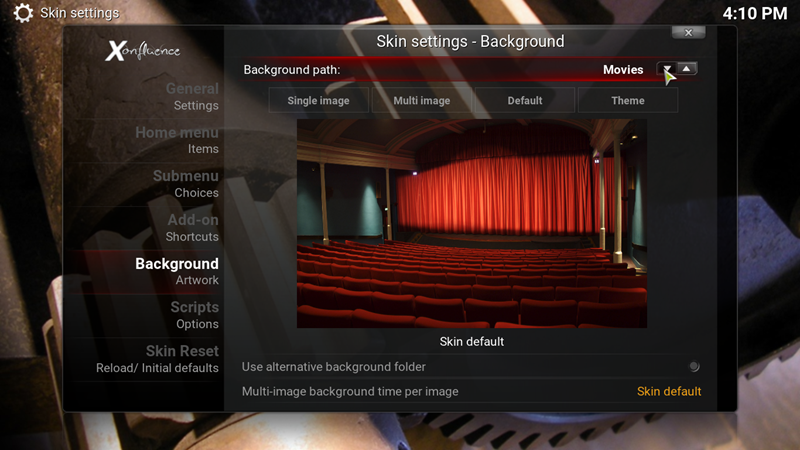 • Before you start your Kodi search for some HD 1920×1080 Backgrounds to use later for Kodi-Backgrounds in every Section. 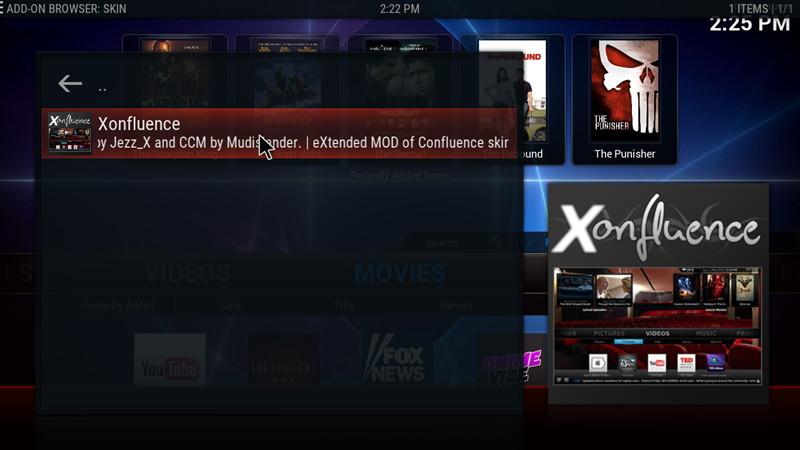 • Now, its time to start your Kodi and begin. Go to System . 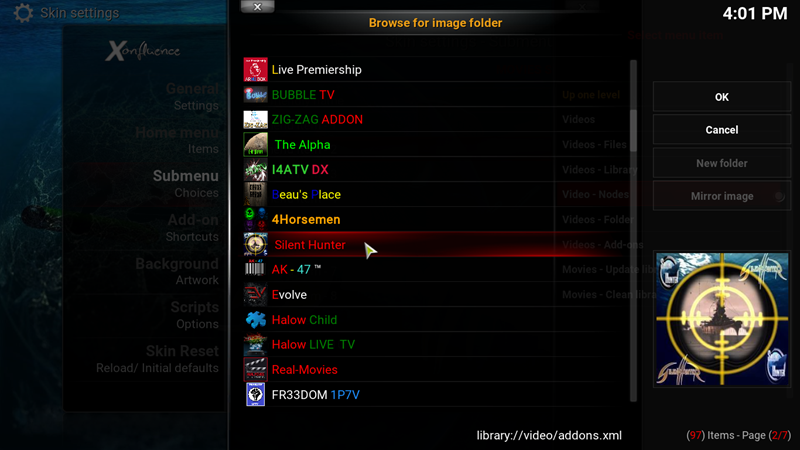 • As you can see our Kodi- Menu color has changed . 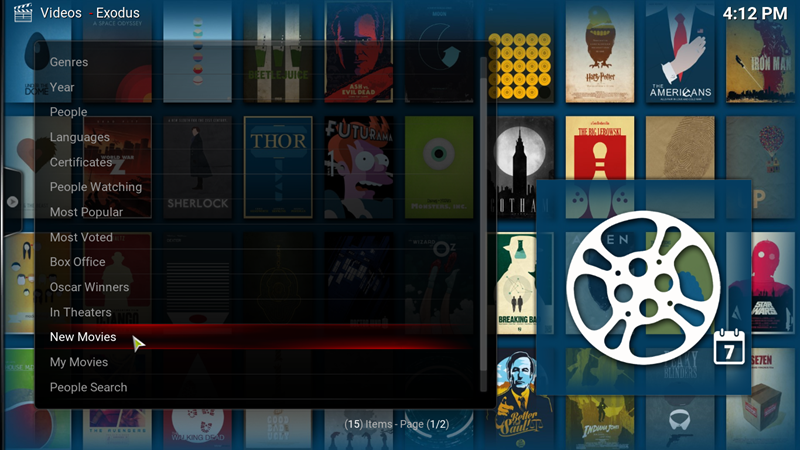 • Now we are going to allow our Kodi to have different backgrounds in each section. From General Settings unselect the option “Enable single global background” . • Click on Default focused menu item . • And change it to any you prefer . For our example we select Movies . 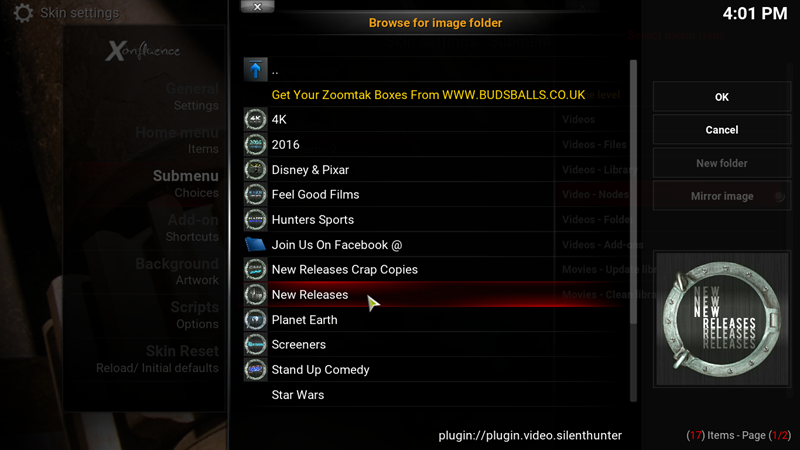 • Next tip : We will show you how to get rid of the Kodi Icon on your Kodi Main Screen Top Left Area . 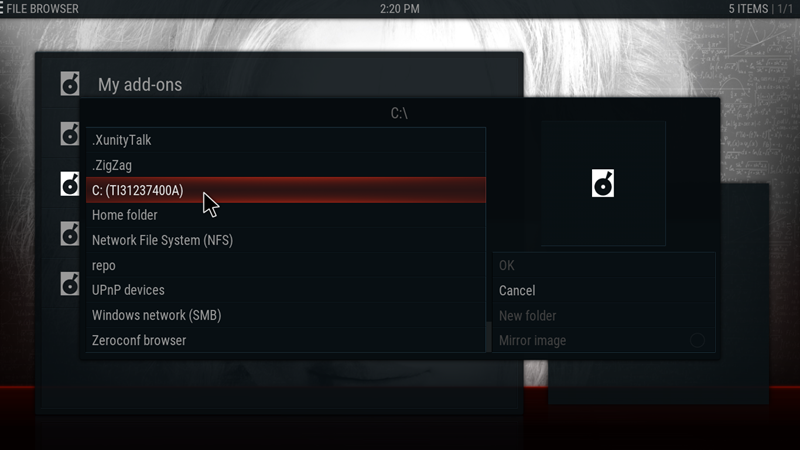 In General Settings again, on the bottom click on Home top left info area . 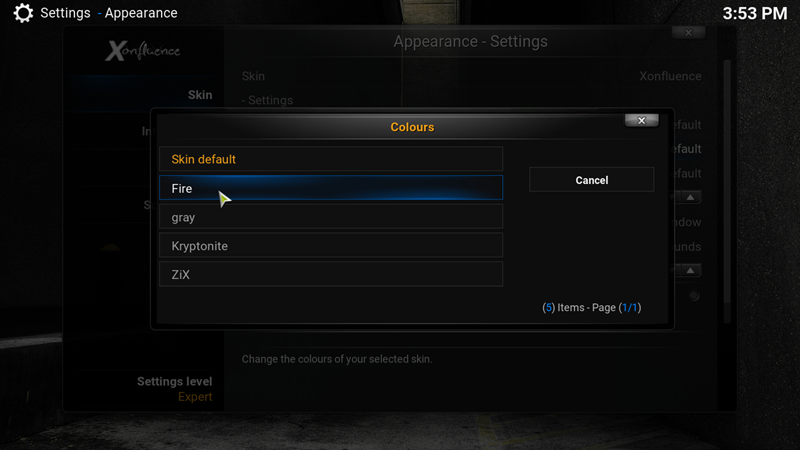 • The indications change as you click, stop when the selection Hidden appears. 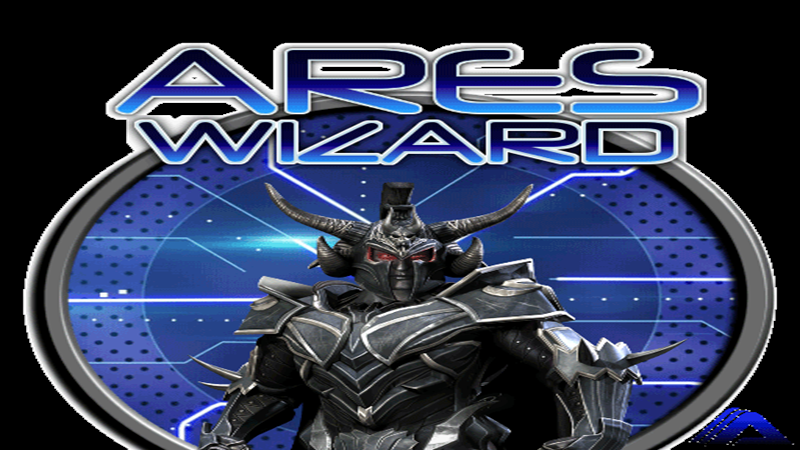 • Now we are going to build our own Main Menu on Kodi . Let’s begin. • Let’s delete the Main Menu items we don’t need. Go Home menu . • Select Menu item – 1 or from top you can browse to the menu item you want to delete. • On the sidebar that appears select Clear menu option . • As you can see our menu item is erased . Repeat this process for every one of the other Menu items you want. 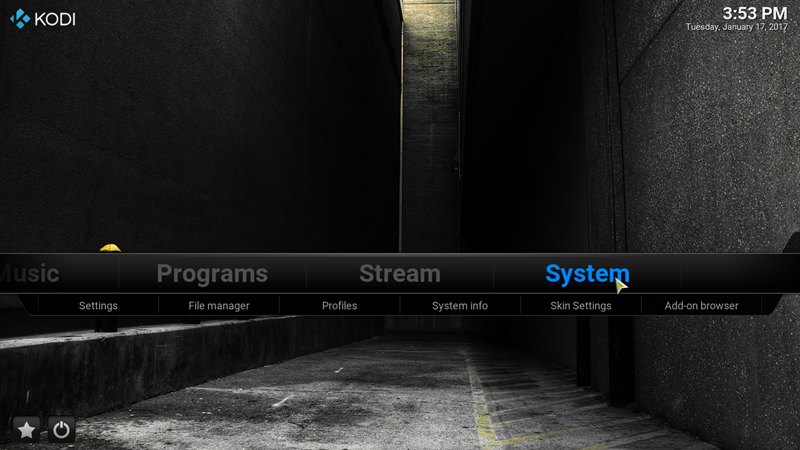 We recommend you leave the System Menu as it is for the moment. • After finishing with the deletion of the menu items we will build the categories of the menu. First move to Submenu Choices . • Go on top Select menu item: and click the arrows to browse the selections. • Browse to User selection one Submenu set and click User friendly name . • Type the name of the Label you want. 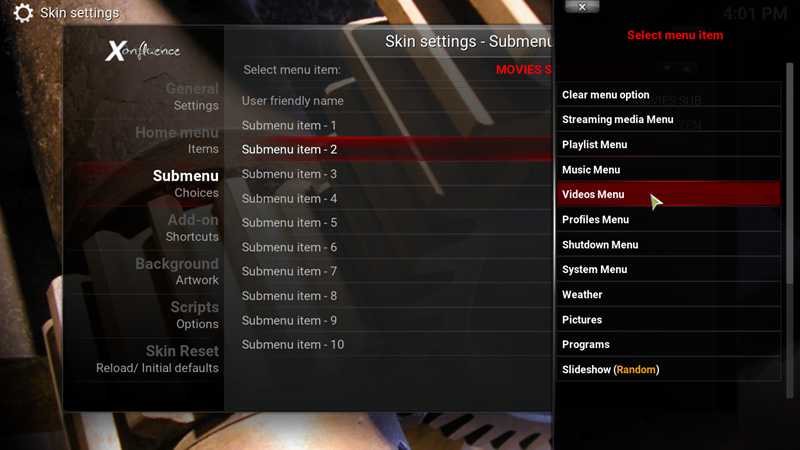 For this example we are building Movies submenu. Type MOVIES SUB and click done . 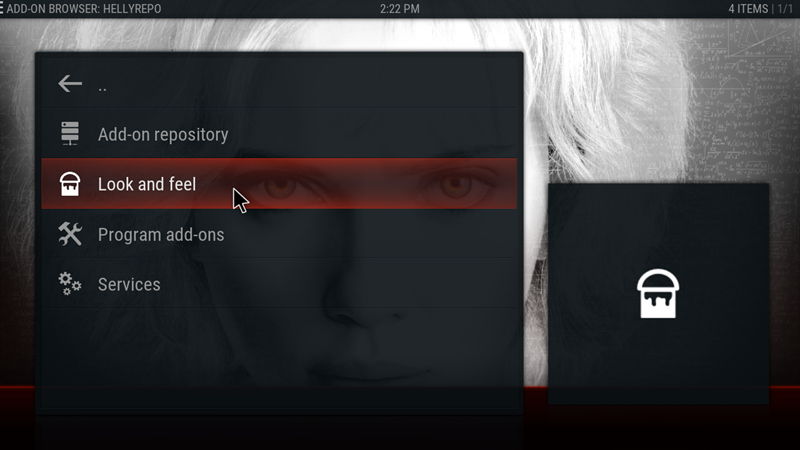 • Then, click Submenu item – 1 . 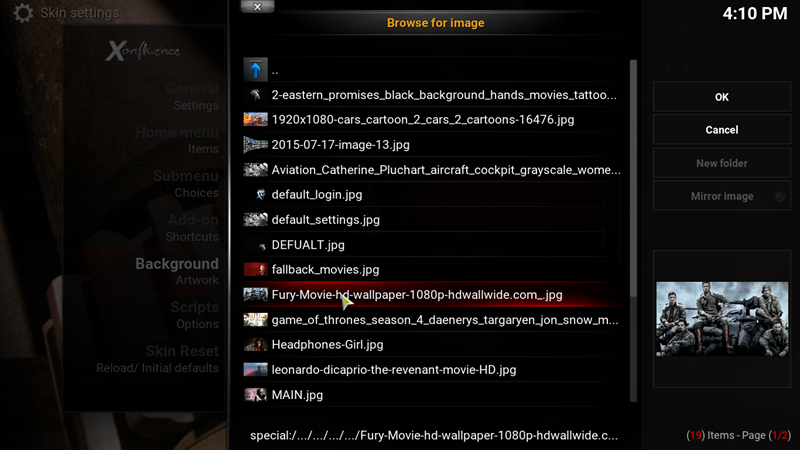 • Here you will add your favorite video add-ons. 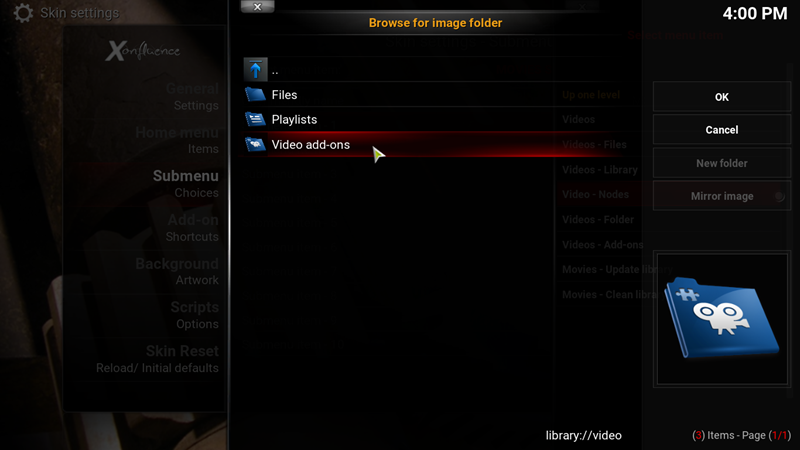 On sidebar click Videos Menu . • Then, Video – Nodes. • Click Video add-ons . 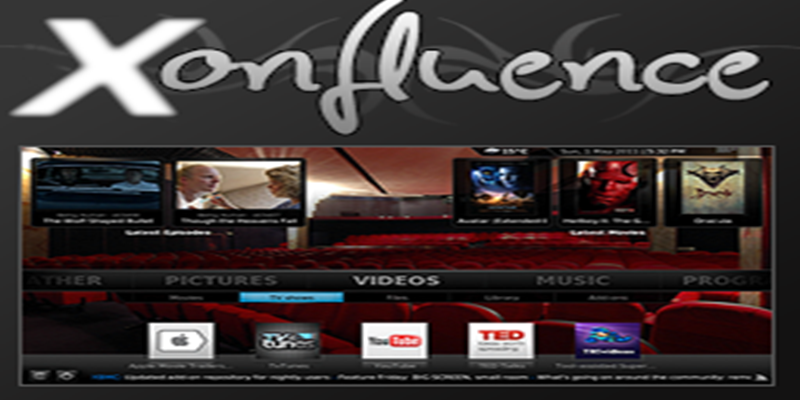 • We can see a list with all your video – add-ons. For our example we are going to use some of our favorites add-ons. 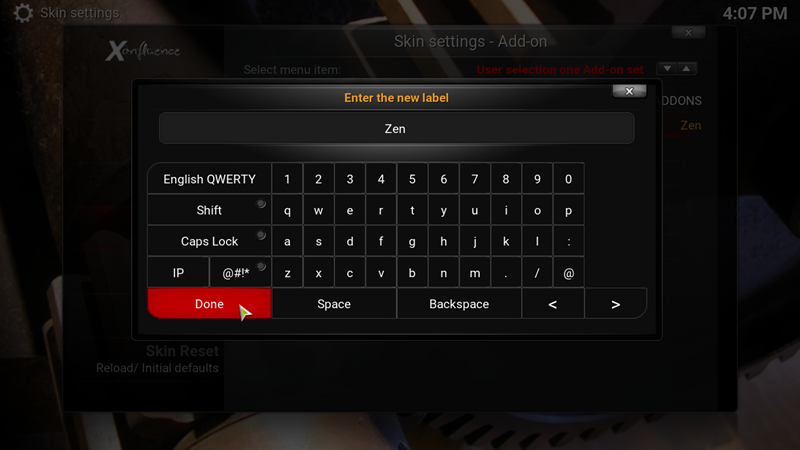 Select Zen . 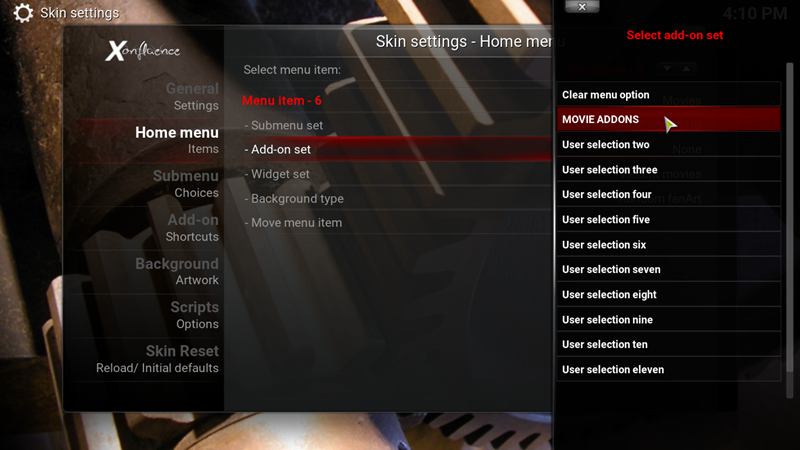 • Then click OK .
• Next, move to submenu item – 2. Same proccess. • Select the Videos Menu . • Click Videos – Nodes . • We select Silent Hunter for the next example . • We click on the New Releases section. • When the Section opens click OK .
• Next we are going to make shortcuts for Add-ons . This will appear below our Menu – Item and Submenu – Item . Go on Add-on shortcuts . • On User selection one Add-on set, click to type a name for the shortcuts. Select User friendly name . 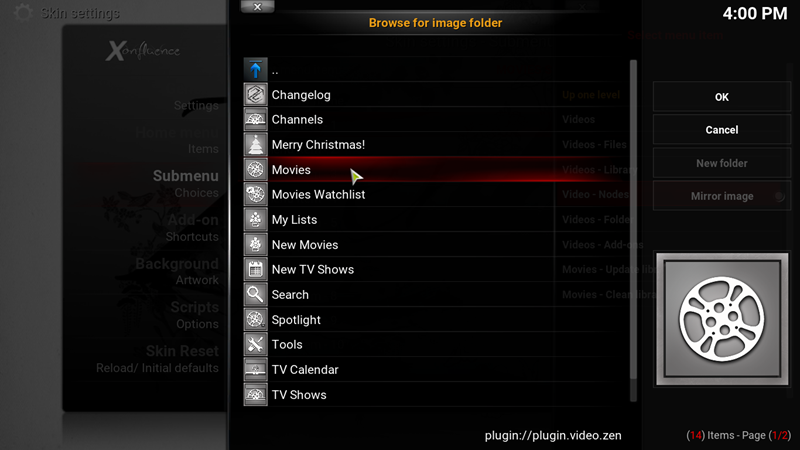 • Type MOVIE ADDONS and click DONE . 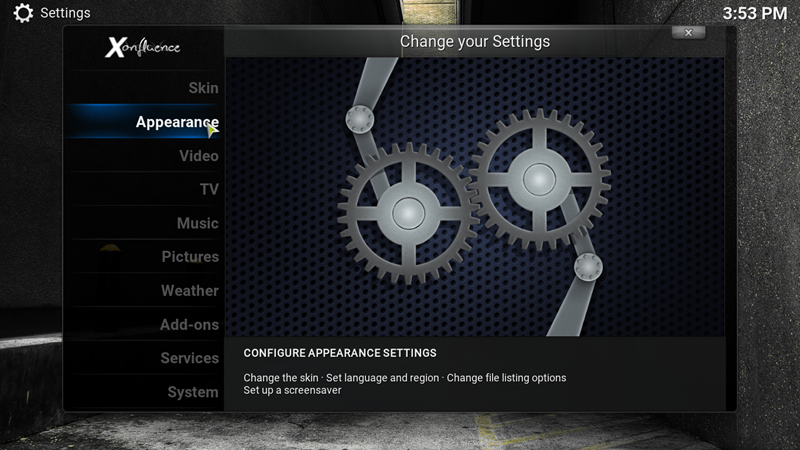 • Next, let’s config the shortcuts with our favorite add-ons. Select Add-on 1 . • On the sidebar click Video add-ons . • For our example we choose Zen . • Type the name you want for Label and click DONE . 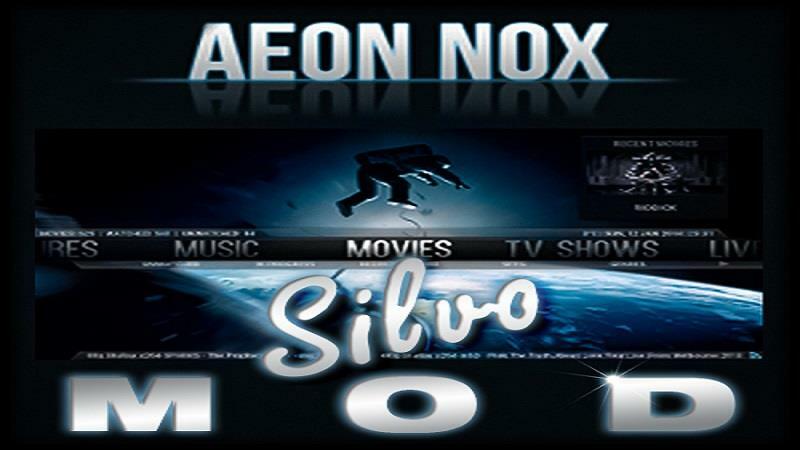 • We repeat the same process for the others Add-on Shortcuts with MetalliQ, Real Movies, Openload Movies, Salts and Exodus. At the end our Add-on Shortcuts will look like this..
• Now, before we implemented the features we created, let’s add our backgrounds. 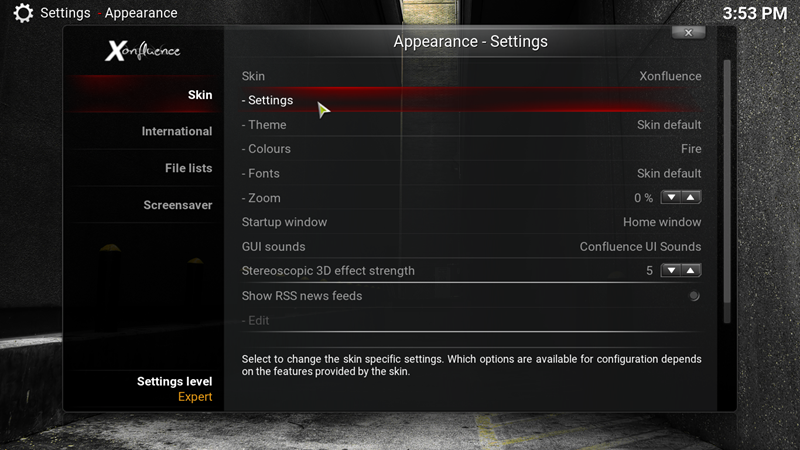 In Skin settings select Background . • From top select the path you want to add your Background using the arrows. 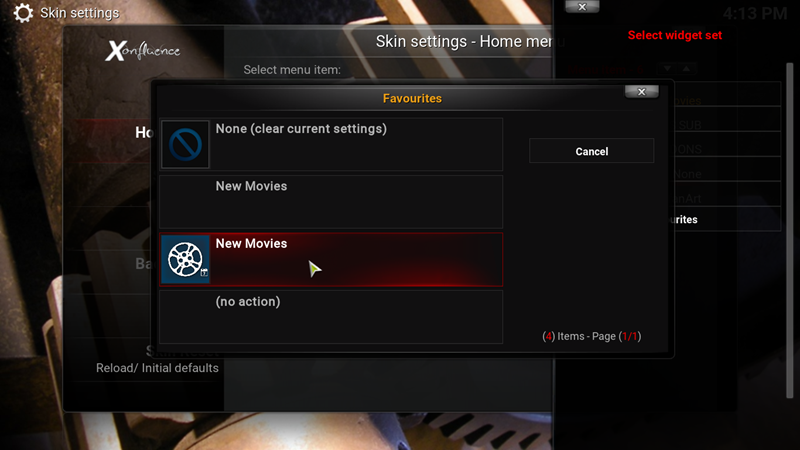 Select Movies . • Below you will see four options. 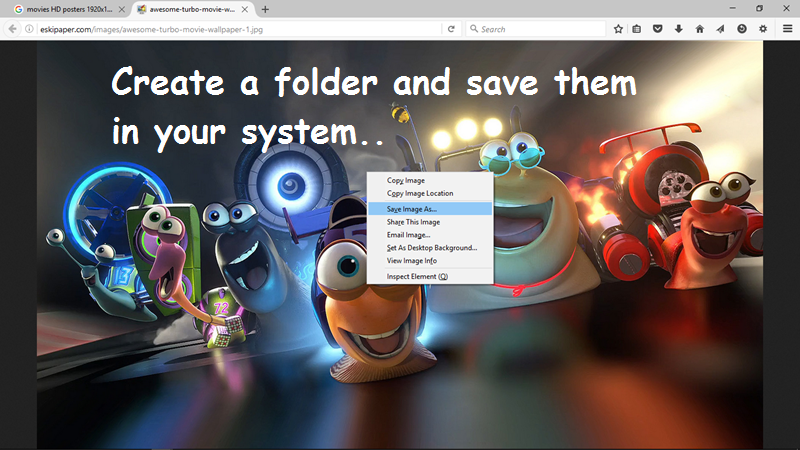 We are going to add Single image, in this example, but if you want you can choose Multi-Image which will change your Background Image depending on time you will set at the bottom, in option Multi – Image Background time per image . 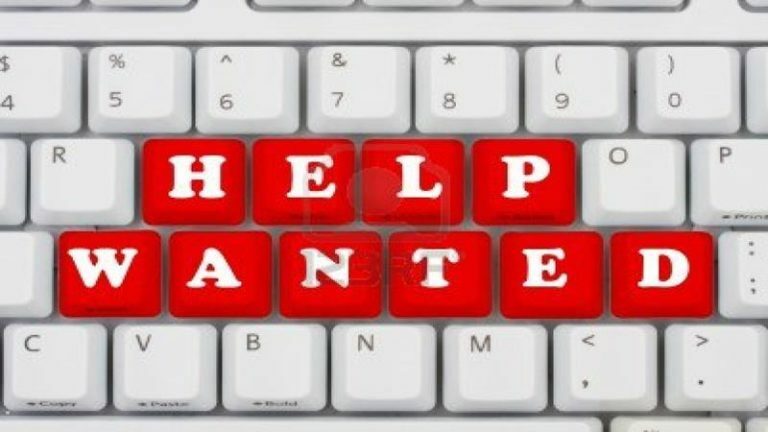 We want something simple so lets click Single Image . • Kodi will automatic open the skin’s Background Folder where we saved the Folder with our Images. 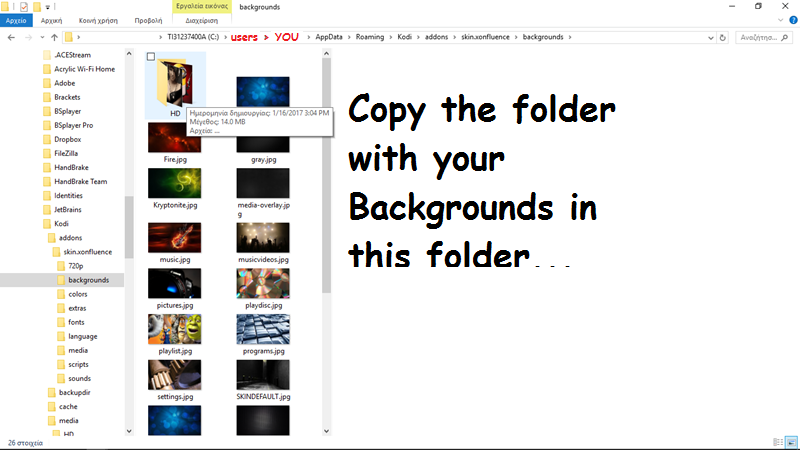 Select your Folder . • Select the Image you prefer . • It’s time to implement everything we created until now. Let’s see our amazing Work. From Skin Settings again select Home Menu . 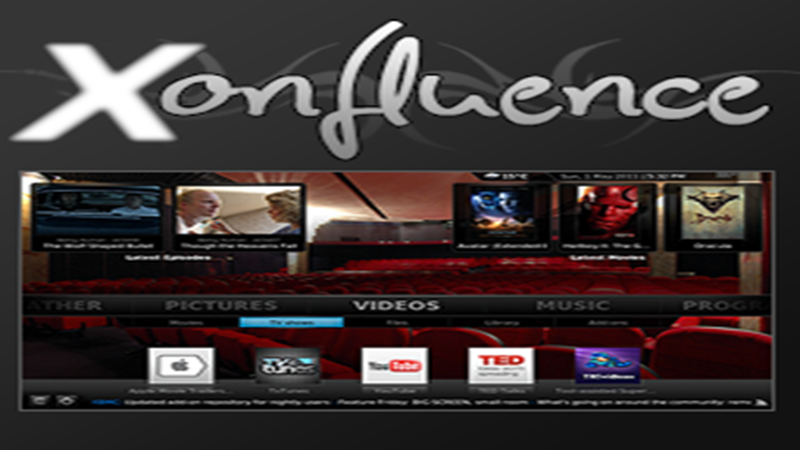 • In menu – item –> Movies click on Submenu set . 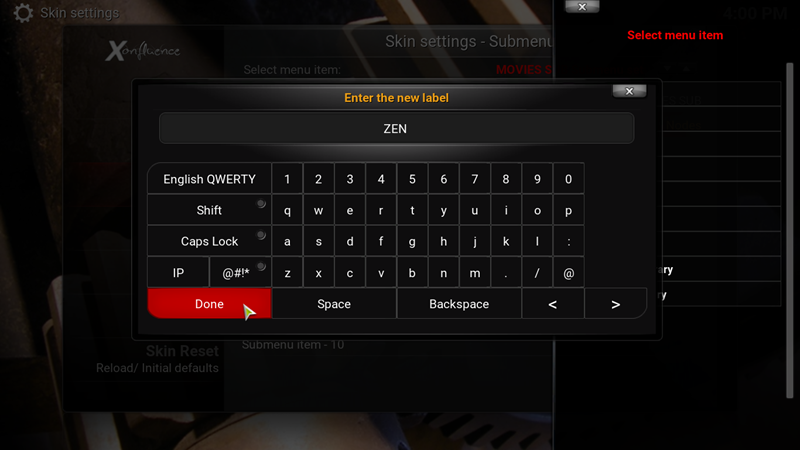 • Select the name you typed for your Submenu. Our example was MOVIES SUB. • Now, let’s add our shortcuts. 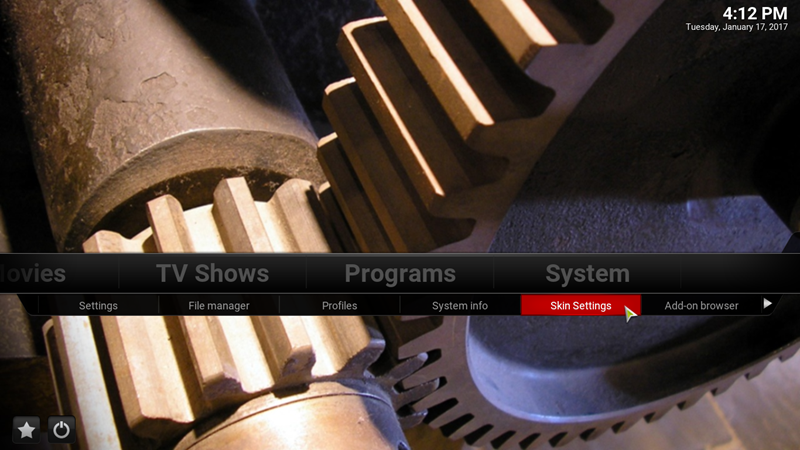 Click on Add-on set . • Our Movies section is ready with Submenu and Add-on Shortcuts. It wasn’t that hard right?. Now let’s do the final step. Let’s add a Widget. We have a simple and easy way for you using the Favorites Function. For our example we choose Exodus . • Right Click on the section of the add-on you want your Widget to show . • Click Add to favourites . 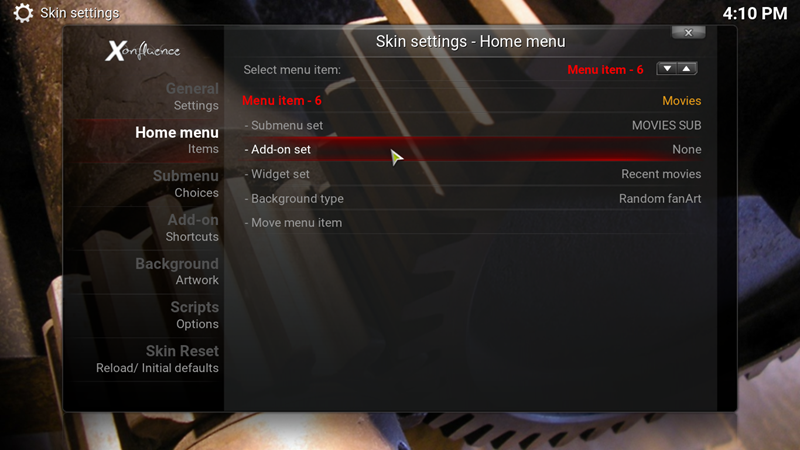 •Then go, System –> Skin Settings . 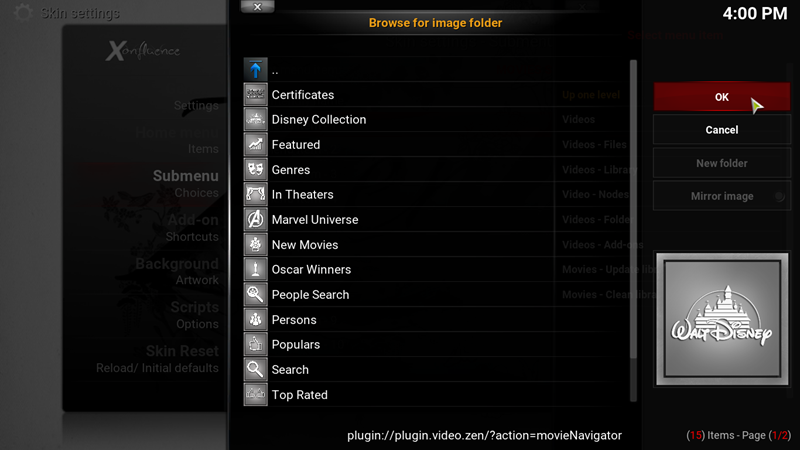 • Home menu, browse to the Menu you want, in our case Movies, and then click Widget Set . • From sidebar select Custom widgets – Favourites . • Choose the section you added on your favorites . 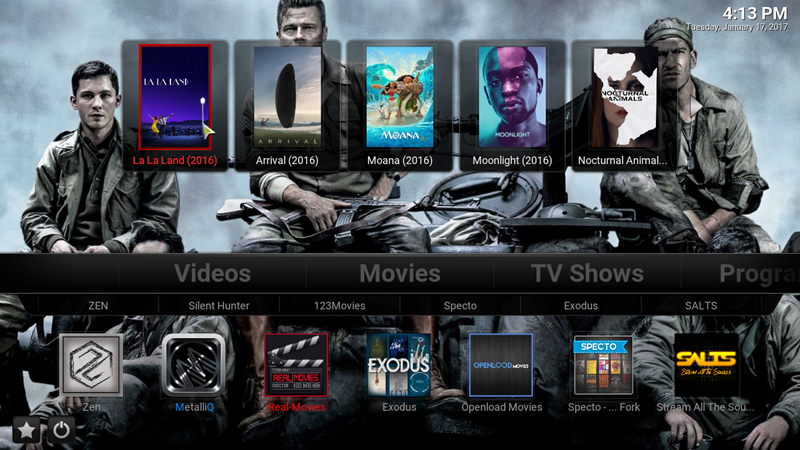 • Now move back to the Main Screen and you can see your Movie Section complete. 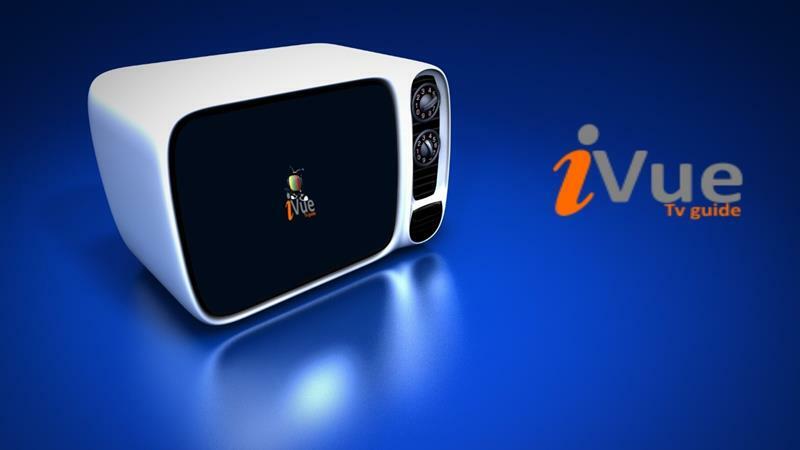 You can repeat the process configuring all the sections of the Main Menu and create new ones, like TV Shows, Sports, Cartoon, Live TV, News, etc. 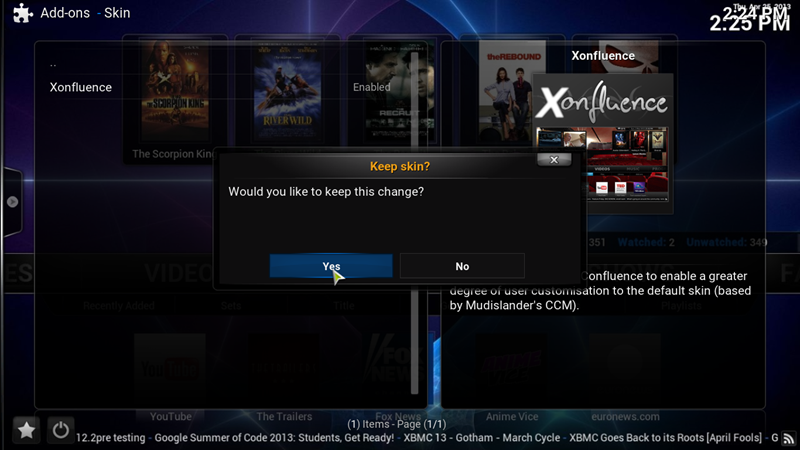 There are many options in this skin to change and make your Kodi Unique and easy to use according to your preferences. 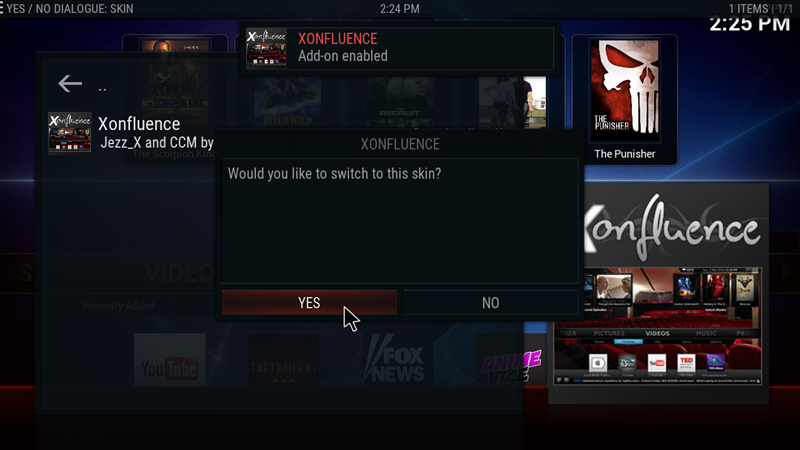 For more information and support on Xonfluence skin you can always visit the Kodi Forum.